Polen und Litthauen von 1125 bis zu ihrer Vereinigung 1386. 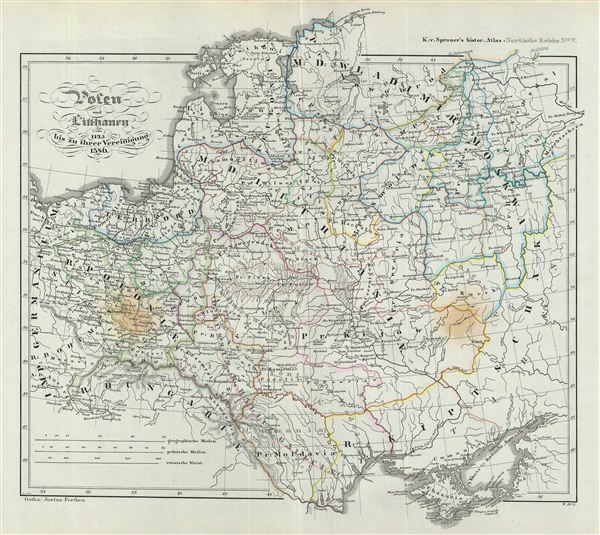 This is Karl von Spruner's 1854 historical map of Poland and Lithuania from 1125 until its unification in 1386. The map covers Poland and Lithuania from Nowgorod to Chazaria, detailing a time when Lithuania was the largest country in europe. The region underwent a dramatic realignment in 1385 with the Union of Krewo, or the marriage Jogaila, Grand Duke of Lithuania, to Queen Jadwiga of Poland. The act lead to the union of Poland and Lithuania and four subsequent centuries of shared history. The whole is rendered in finely engraved detail exhibiting throughout the fine craftsmanship of the Perthes firm. Prepared by Karl Spruner for publication as plate N V in the second edition of Justus Perthes' 1854 Historich-Geographischer, Hand-Atlas zur Geschichte der Staaten europa's vom Anfang des Mittelalters bis auf die Neueste Zeit. Very good. Blank on verso. Original centerfold. Original platemark visible. Minor fox mark both left and right of center, see photo.